Well, I’ll pass on the snakes but boy, that grebe is adorable! And so too the squirrels. I love the squirrels till they take over my bird feeders and eat the whole thing! It will be exciting to see if you can spot the new babies! I doubt I’ll be back in Rockport this spring, but I will be back at the plantation, and I’ll look for any activity around there. The youngsters are great fun to watch. 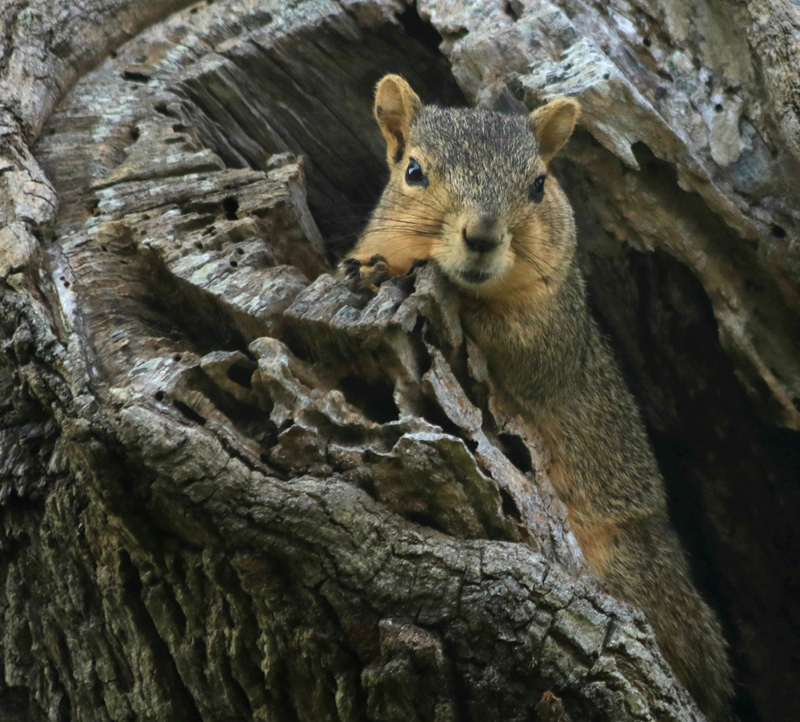 I actually see more at the yacht club where I work than anywhere else — it’s great to work in a place where the squirrelly ones are literal rather than metaphorical. Yea or nay, can we say “the eyes have it”? These are all great shots. I especially like the grebe’s rather wary “what are you looking at, lady!” glare! The grebes are among my favorite water birds, and the pied-billed most of all. Sometimes at the refuges, we play a little game. They dive underwater, and I try to predict where they’ll pop up. Usually, I’m wrong. The squirrels certainly made use of that break of lovely weather between the rain and cold around here, too. Noticed house hunting bird couples checking out the tree branches, too. Laughed over you comment over the games grebes play. Even Molly is most intrigued by that. Really liked that first pix – the detailed dance of shaking those tail feathers. What a hoot that curious snake snoot. Great catch! I actually saw two rat snakes that day. One was a youngster, and only about eighteen inches long. I have a photo of him with his tongue out, and of course all those references to ‘forked tongues’ in history and literature came to mind. I do enjoy the grebes. There’s one that seems to be solitary swimming around Lakewood these days.It doesn’t seem like the greatest place to live, but I suppose it’s finding what it needs, or it would move on. Speaking of bird couples, the grackles have begun courting, and it’s such fun to watch them strutting around. Cheeky things, but entertaining. Love everything about this post except the snake! Those things — even the nonpoisonous ones — give me the creeps. Perhaps we’ll just tolerate our bats meekly! I’d take a snake over bats any day, Debbie — at least, the non-venomous ones. 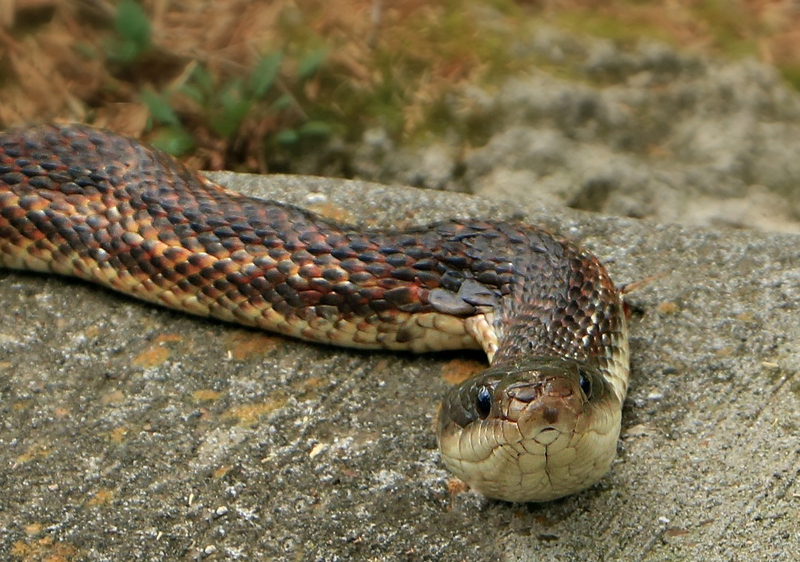 The rat snakes actually are good to have around, since they got their name by helping to keep mice and rats under control. But we all have critters that give us the creeps: at least, I suppose most of us do. I hate millipedes. If I happen across one, my response isn’t exactly rational. But they have nothing to fear from me. I want nothing to do with them, and always head the other direction when I spot one. I agree with Debbie on the snakes, creepy and all-too-quiet sneaky. They are quiet, although my houseboy in Liberia could hear them moving through the grass. Every now and then when we were doing something outside he’d suddenly say, “Snake!” and point to its location. It was amazing, but I was glad he and many others had that ability, since there were plenty of snakes around, and some were truly deadly, like the black mamba. I far prefer this nice rat snake! Wish I had that ability. I was out reading at my picnic bench one day and had a black racer decide to take a nap between my feet. Now, that would get my attention. I get entirely creeped out by the stories of guys opening up their deer stands for the season who discover whole families of rattlesnakes have made themselves at home. This was a great expedition, you weren’t kidding about “bright eyes,” excellent shots. And I always learn something – – drey! I never knew there was a name for squirrel nests, glad to know it now! I can remember it easily, gray squirrel/drey nest. I see you have two species of flying squirrels in your area, too. I’ve enjoyed watching them at night on the Cornell feeder cam. It took me quite a long time to figure out what was roaming around in the middle of those frigid nights. Whichever snake it might be, I will never be delighted by that encounter. Well, then… I hope the snakes in your area pass the word, and leave you alone. It would be the neighborly thing to do! So far the snakes arounf here seem to have got the word, except for a small one I saw some time ago [https://wp.me/p4uPk8-Zw] and the very little ones the cats sometimes kill and bring. It was different down in KC. There we sometimes had those unwelcome rattling visitors. They are all so cute, even the Rat Snake. We have large Rat Snakes in Illinois too! This is the largest rat snake I’ve seen, and it was impressive. It was being a little lazy, too. It was a cloudy, damp day, and I suspect it had come out onto the sidewalk’s edge to enjoy a bit of extra warmth. Like the vultures, they have an important role to play, although the alternate name ‘chicken snake’ suggests their unfortunate tendency to invade the hen house. Such a sweet post to bring joy and smiles to my morning. The little birds are starting to gather around the feeder here which means that autumn is well under way. It feels autumnish here today, after a cold front that was a little colder than many of us expected. Still, it’s not going to cause any of the creatures discomfort, and soon we’ll be back in springtime temperatures. The bluejays and cardinals are feeding youngsters now. They make trip after trip to my balcony to pick up peanuts in the shell. I’d offer different kinds of seed, but if I did the pigeons would be back, and I tired of cleaning up after them. So, I keep the water bowls filled, and that brings in mockingbirds, sparrows, finches, and doves. The thing that always fascinates me about squirrels is their stop motion movements. I know that house cats — and their wild cousins — have gained excellent night vision at the cost of their ability to pick objects out from a background. Cats are supremely efficient at spotting movement of any kind and zeroing in on it, but the minute that motion stops, they lose it in the background. (Which is why a cat will chase a moving object like a ball, but then just sit there and appear to lose interest in it once it stops moving — as far as they’re concerned, the minute it stops moving, it vanishes mysteriously!) This ability of the squirrel to make sudden fluid movements, and then stop stock still helps them evade predators. I didn’t know that about cats. I certainly saw that behavior pattern in Dixie Rose, but I suppose I thought she was easily bored. I finally went looking for information on those other slick-moving squirrels, and found this short PBS piece on flying squirrels. They really are amazing. The little pied billed grebe seems elfin in all of its dainty like appearance. I remember seeing some of them as a youngster on small lakes in my area. As for the squirrels I feel sorry for them as they must defend their young from a number of predators. I have a generous supply of nests high in my trees and apparently the mamas have been defending the nests from predators since there is an adequate supply of squirrels that eat from my fig trees. ‘Elfin’ is a perfect word to describe the grebes. They are so small, and yet so alert. I suppose all birds are alert, but these make their attentiveness to the world around them visible as they dive at the slightest provocation. And, honestly? They’re just cute. I laughed at the wry humor in your comment that you have an adequate supply of squirrels to eat from your fig trees. It’s the mockingbirds that do in a friend’s figs here, and possums that annoy my gardening friend in the hill county by devouring her figs and persimmons. But I’m sure the squirrels do their part, and their mamas no doubt are proud of them. Actually the white wing doves, cardinals, woodpeckers,, mockingbirds, and possums help eat the figs too, but the squirrels do the most damage because there are so many of them. The squirrels there have an early start. The ones here just began to appear a week ago, and the snakes will come out much later. Great photos! I think everyone’s happy to be experiencing warmer temperatures and more sunshine. It was about a month ago that I started hearing cautions about rattlesnakes in the dunes and being wakened by morning birds singing, so we are quite a bit ahead of you — as it should be. I was delighted to have such a gorgeous rat snake appear. I found a smaller one in the grass, but it was nice to have such a clear view of this large one. I don’t think we have squirrels in Australia. Probably too many cannibals? We do have many possums and corellas, many parrots of many sizes and colours including a pitch black large parrot. I was also amazed that the bush holds many native acacias of which, world-wide, are over 1500 species. I believe many grow in Texas, Linda. The snakes look friendly but most people are scared of them while in fact the snakes are more scared of people, with right reason. The Government here in Australia is doing its best to educate people not to kill snakes but rather call in snake rescuers if a house has been invaded. The snake gets rescued and put back into the bush. They are protected. I took a quick look, and discovered that our species never have been there, and certainly wouldn’t be welcomed, as squirrels generally are considered invasive and harmful to native species like the possums. I did see a note that a couple of species were introduced at one time, but they went extinct, and while squirrels can be had as pets, they have to be incapable of breeding, microchipped, registered, and so on. That sounds like more trouble than it’s worth, to be honest. Acacias do grow here, and as a matter of fact I recently photographed a couple of specimens, so you’ll have a chance to see them. On the day that I photographed the snakes, I became aware of the presence of the first, younger and smaller, one when two women came shrieking up from a pond, yelling, “SNAKE!” It would be an exaggeration to say they ran all the way to their car, but they certainly weren’t willing to give the poor thing a second, appreciative look. I know snakes have a bad reputation, just like spiders, but they play important roles in the environment. To be honest, they can be fascinating. The thought that a snake can climb a tree still amazes me. 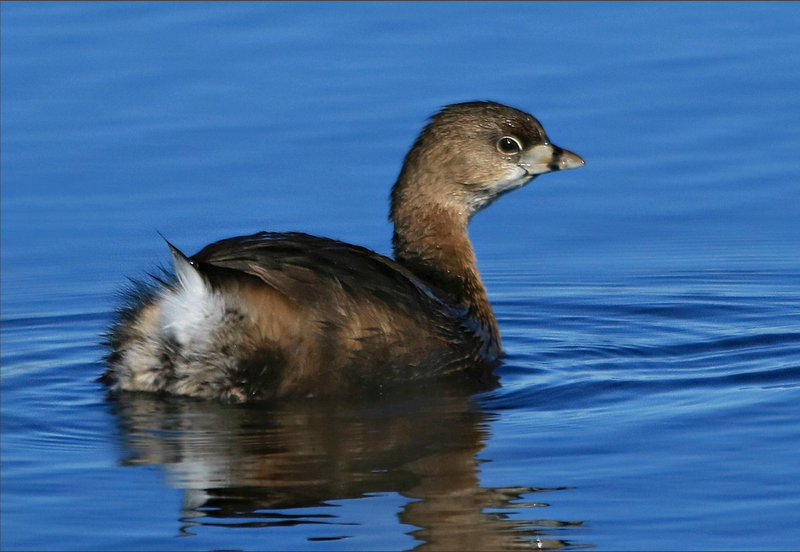 The pied-bill grebe is indeed a cutie and it’s a lovely shot. I’m sure others have said it, however I’ve never heard a snake described as sweet, but I also wouldn’t disagree. I like snakes and never quite understood the terror they instill in people. I wouldn’t offer one a mouse held between my lips, but I wouldn’t run away either. I can’t vouch for the snake’s disposition or behavior, but that expression on its face seemed sweet to me. We tend not to think of snakes as vulnerable, but I suspect they spend a good bit of time evaluating the threat level in their world. I laughed at the thought of you dangling a mouse for a snake to take. It reminded me of the porpoise trainers I’ve seen do that with fish. I’m not sure which would be more nerve-wracking. An off-target porpoise could do some damage. Your laughter was my intention. I can’t claim that entirely for my own. I am not able to find it on the web, but there was a “Looks at Books” episode on Saturday Night Live with Dan Akroyd as the author of a book named “Mauled”. He looked pretty gruesome and had some advice for the audience. “Don’t feed a bear a marshmallow like this” while holding it between his lips. On a less terrifying note, I used to feed our first beagle, Cassie, broccoli that way. She’d leap and gently take it from me…popcorn too. Speaking of vulnerable, While we were walking Bentley yesterday, we happened across a garter snake considering crossing the road. We explained the dangers of the speeding cars in our neighborhood and gently nudged it back to the grass in our neighbor’s yard. I hate picking up squished animals on our quiet little street. Do you ever get squirrels or snakes at the shelter? Or are there specialized places for such creatures to go? 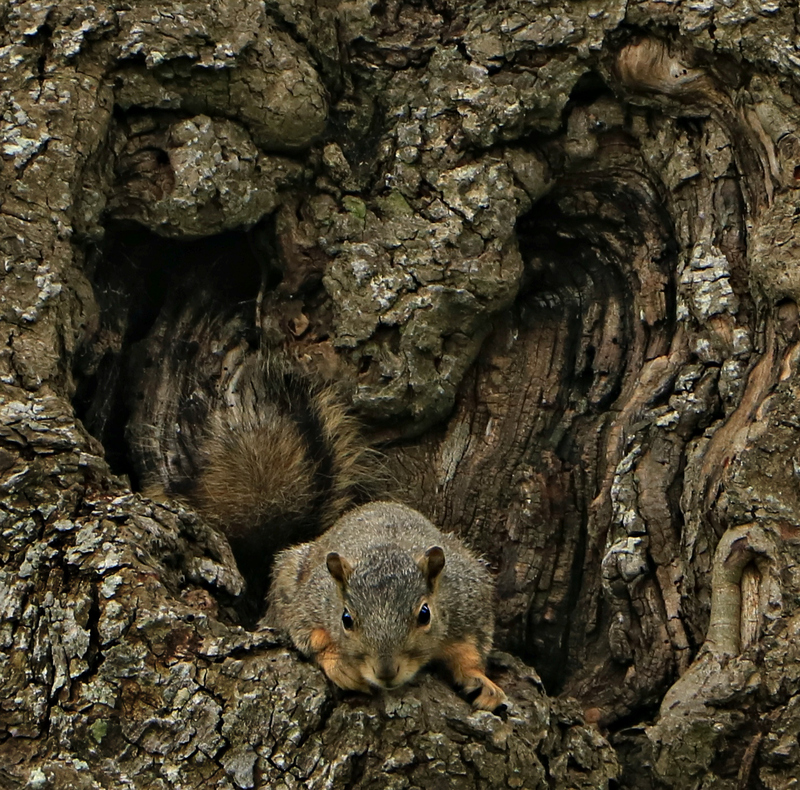 I didn’t mention that one reason some of these old, hollowed-out trees are kept is for the squirrels, woodpecks, and such.